Perhaps the most immediately visible, the most evident difference between the United States and Vietnam is traffic—the composition, volume, and extent of cooperation among drivers. Motorcycles swamp the Hanoi and Ho Chi Minh City streets and dot the country side. They swarm like bees on an apple core. They are mostly middle-sized motorcycles or motor scooters. The drivers are men and women, young and old, including a scattering of elderly women. Motorcycles are packed tight at almost every corner. According to latest statistics from the Vietnam Ministry of Transportation the number of motorcycles exceeds 37 million for a country with a total population of 90 million. There are 1.8 million cars. The Ministry’s planning forecast was for 36 million bikes in the year 2020. 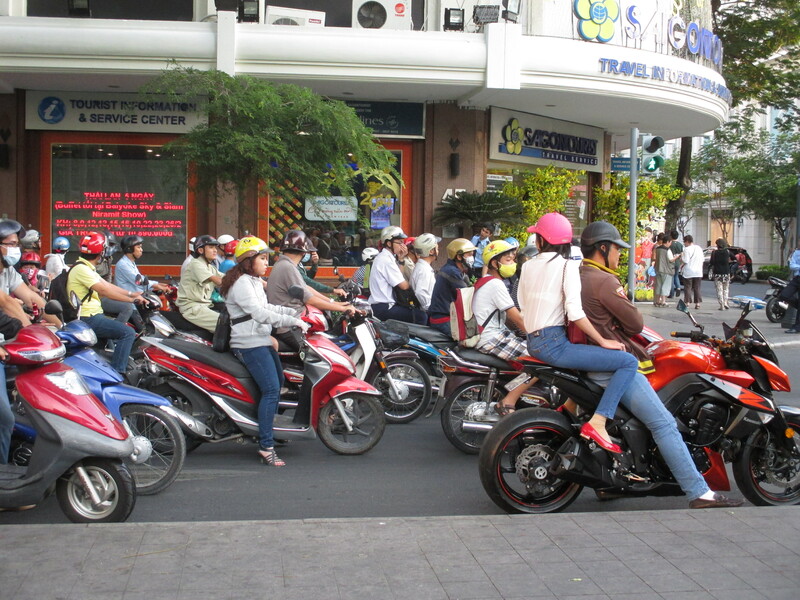 Ho Chi Minh City has over 5.6 million motorcycles for a population of just over 9 million. In the U.S. there are an estimated 9 million motorcycles for a population of over 300 million. There are motorcycles on county roads, too. My Hanoi student tour guide mounts her bikes after retrieving it from the side-walk parking lot. By my count, solo riders make up about a quarter of the bike traffic, about half the bikes have two riders, and another quarter have three, four, and even five riders. 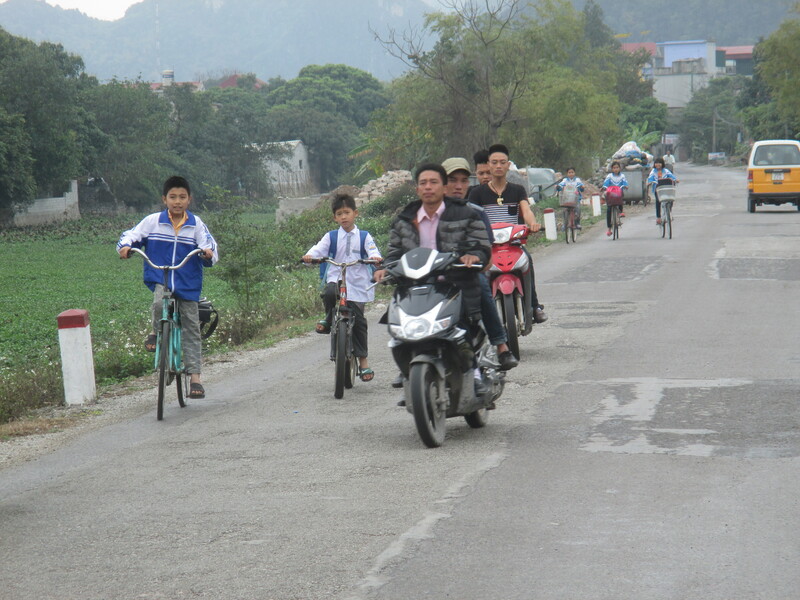 It is not unusual to see both parents and three small children on the same bike. Bikes carrying dogs are seen every day, as are bikes carrying house plants, bird cages, and bundles of vegetables. Food delivery bikes are at about every intersection. I saw a bike with a man driver, and a women rider holding a baby in one arm and a bouquet of flowers in the other. Another unforgettable bike was carrying four automobile tires—one strapped to each time with two more stacked behind him. A family is attempting a U-turn on a busy street. A mother with three children, two without helmets, are stopped at a light next to a bike with two riders and a taxi. Helmets are required by law, but children passengers under the age of 14 are not required to wear them. The definition of a helmet evidently includes big straw hats. Many riders wear cloth masks so they breathe in less exhaust and many women wear scarves and veils under their helmets. Young women wearing skirts driving motor scooters are common as are young women wearing skirts sitting side saddle as passages on larger motorcycles. About one out of ten bikers is an active cell phone user—even the driver. Mixed into the mass of motor bikes are a few pedaling bikes but it nothing like Japan where everyone seems to be pedaling bicycles. There are motor bike parking lots on almost every block in the two big cities with attendants who are responsible for collecting a parking fee and keeping the parked bikes in order. Bike mechanics scattered throughout the city. 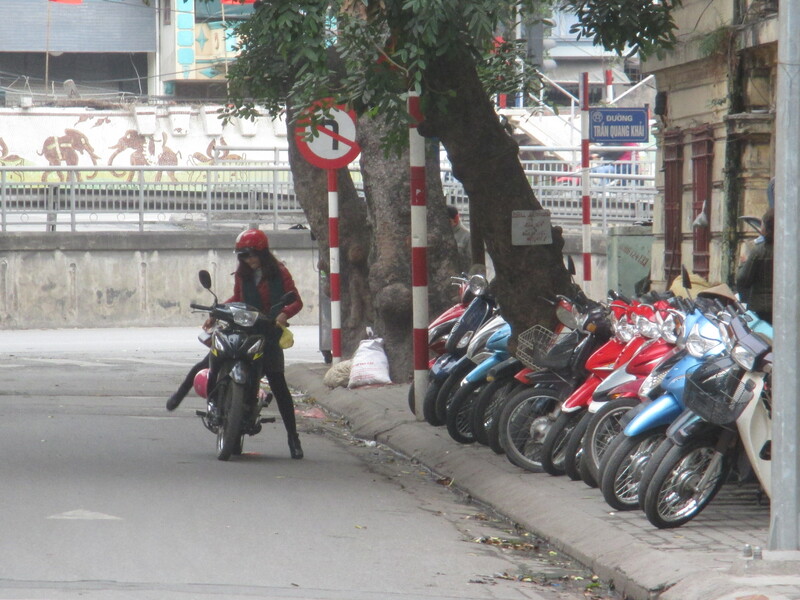 Motor bikes can be rented on almost every block in the center of Ho Chi Minh City. I resisted the urge to rent a bike. A famous monument at 7 AM in Hanoi. The same monument becomes a parking lot by 9 AM. Pedestrians, especially foreign visitors, are challenged in crossing the street safely. A native resident told me there are two ways to try to cross the street: (1) look for an opening and walk at a steady pace regardless of oncoming vehicles or (2) close your eyes and pray to God that you will make it to the other side. I usually waited patiently for several Vietnamese pedestrians crossing the street and tagged along, keeping them between me and the oncoming traffic. The only traffic rule I was able to infer was to keep going straight and stop as little as possible. Bikes turning right at intersections just seem to blend in without giving an indication they looked both ways. There are few, maybe no, hand signals. When there is a near miss, both drivers just seem to self-correct and keep on going. There is no road rage—no angry reactions nor hand gestures. There seem to be very few “overly aggressive drivers”—but all the traffic was moving rather fast. Horn sounding happen every block but are not ear piercing shrills. Motorcycles intending to turn right jump up onto the sidewalk to bypass the pack of cycles stopped at an intersection and proceed on down the side street. Bikes, and taxies, went the wrong way on one way streets a half a block or so to stop in front of a hotel or store to drop off a passenger. There were no traffic cops pulling over drivers or directing traffic at rush hour. Reciprocity, not regulations, seem to be the rule. Traffic accident are consider high, with about 20,000 fatalities, but data is not broken down just for motorbikes. DUI, outdated roads, and lax enforcement are given as reasons for the high level of accidents.